Some inexperienced cooks tend to get the functions of a food processor confused with that of a blender and think that they can use either one for certain jobs. This will almost certainly result in their ingredients being ruined, or worse still, having their appliance damaged. So what is the difference between a food processor and blender? The former is a versatile machine that can work on heavy or dry foods. Using different blades, it can chop, julienne, pulverize, knead and mash foods easily. The latter is only meant for foods with some liquid content in them or that have liquids added. It is good for making smoothies, sauces and batters. So what if you want to do all these jobs at one time or another? You can either buy one of each, or if you have a small kitchen or a small budget, you can combine the two appliances into one. The best blender food processor combo should be able to do a good job with most of these functions if not all. Here’s a handy link to the top rated of these types of appliances on Amazon. When looking for a blender and food processor combo make sure the overall build quality is good and if your budget allows it, choose one with glass jars and bowls to reduce scratches and odor and stain retention. The number of settings it allows indicates the types of jobs it will do, but make sure its motor is high powered and that the various blades included can actually handle all those tasks. While a few of these combo units may come with dough blades, they may not be hardy enough for tough bread doughs. In that case, you should look at separate food processors that are especially good at mixing dough. Many new models come with up to 16 speed settings, but that’s overkill for most cooks. As long as there are 3-4 distinct speeds with the lowest being quite low, you’ll be fine. You could also look at high performance blenders like the KitchenAid Torrent if your most frequent jobs are juicing and blending with a bit of food processing thrown in. If you only have to puree soups and sauces, whip egg whites and occasionally chop small quantities of fruits and veggies, look into getting an immersion blender that comes with a chopper attachment too. Our blender food processor combo reviews should make it easier for you to choose the best model for your needs, so read on! If you have never heard of the famous Ninja blenders, then you don’t know what you are missing. With an incredible 1500 watt motor that equates to 2 horsepower, this blender food processor will chop, slice and virtually blend anything you can fit in the jar. Plus, this is the best ice crusher on the market! You’ll get crushed ice in only a few seconds with no muss and no fuss. The Ninja Mega kitchen system comes with accessories like a large 72 oz blender, an 8 cup food processing bowl, which is terrific for both chopping and making 2 pounds of dough, and a 3 cup bowl which nests into the larger one and is great for meal prepping and those final touches in your cooking. It can even be used to make nut butters. It also comes with 2 Nutri-Ninja cups that allow you to blend smoothies then pop them off, seal them and take them with you. There are 4 programmed speed settings and they are blend, dough, crush and single serve. The major issue is that the company only offers a 1 year limited warranty, and some people have complained about sub-standard customer service. But the product itself can’t be beat. The whole system does take up quite a bit of space, so make sure you know where you’re going to store all the pieces. Of course, if you are not on a budget and you want the best Ninja made, then you go for the Ninja Ultima Model BL 820. The 3 horsepower motor will make mince meat out of virtually anything in a flash. The dual stage blending blades will evenly, quickly and efficiently, blend even the toughest food items. Crushing ice will take mere seconds, and making smoothies is faster still. While you are going to get a superior blender here, it isn’t going to be inexpensive. You’ll pay for this technology. Also, all of this power makes a considerable amount of noise, but with a 3 horsepower motor, noise is going to come with the territory. On the other hand, the unit itself features 10 total variable speeds with patented cyclonic blade action, a pulse switch and a programmed setting for dough. The accessories include a 72oz. blender pitcher with lid, a food processor bowl with several cutting discs for slicing and dicing and a lid with an in-built feed chute and food pusher, and 2 Nutri-Ninja cups that pop on the blender. When you are finished making your smoothie or other fruit and/or vegetable delight, they can be sealed and taken with you. Even though you’ll get a 2 year limited warranty with this unit, just like its baby sister listed above, there have been some issues about customer service. Regardless of that, this is considered the best consumer blender made, and if you want the best, you go for the Ninja Ultima BL 820. 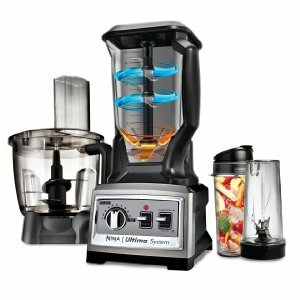 If you love the Ninja name but just want an inexpensive and simple way to make smoothies, then choose the Ninja QB900B Master Prep. The 400 watt motor has easily enough power to make your favorite smoothies in less than 2 minutes, and the convenient 48 ounce pitcher lets you make up a batch and then pour them into your favorite container. Although smoothies are the name of the game here, the unit is versatile enough to chop veggies in the 16 ounce chopper bowl. There are lids for both the pitcher and the bowl, so that you’ll always be able to keep the contents fresh and ready when you want them. As with all Ninja, it comes with a stacked blade for the most effective blending and chopping available. The single switch allows you to manually pulse by press and release, or you can keep it pressed for constant blending. Just be careful here. Keeping the unit running has the potential to turn your fruit or veggies into mush. That’s how powerful this unit is. This Ninja comes with a 1 year limited warranty, but with all Ninjas, customer service and warranty work has been questionable. However, as far as the product goes, it’s first rate. For those who want a blender first and a chopper second, the inexpensive Hamilton Beach 58149 might be the ticket. The 700 watt motor has decent power for fruit and veggies, and although it will crush ice, you may need some earplugs while you wait a couple of minutes for the blender to do its thing. It is very loud. This is one of the lowest price blender/choppers available, and the 5 cup glass blender does a very good job at making smoothies. Its lid has a small hinged opening to allow you to add ingredients midway through the blending. The chopper, with its plastic 3 cup bowl, will work okay, but you might have to manually use a spatula to keep things moving and chopping. Veggies seem to get stuck near the top, and they’ll need to be moved to the bottom where the blade is. This is only a chopper and does not do other usual food processor tasks, but at this price you can’t complain. That said, there are 2 speeds plus a pulse feature and it comes with a 2 year limited warranty. From one of the most recognizable names in the business, comes the Oster Rapid Blend blender and processor. This 450 watt unit also converts to a food processor, giving you the best of both worlds. 8 total speeds gives you speed control like few others, and the limited warranty is an amazing 10 years. The 3 cup plastic food processor works, but don’t expect evenly chopped and perfect pieces even though it does do other jobs like shredding as well. The glass blender jar is 48 ounces, which equates to 1 1/2 liters of smoothie goodness. This blender is loud, but it is one of the better smoothie makers out there. Better still, you can actually attach mason jars to the blender, using the original mason jar seal as a gasket, and blend inside of them. This gives you a versatility that is unheard of in the blender world. It may not be as fast or as quick as some of the higher priced units, but for the price, it’s hard not to like. 500 watts of power gives the Cuisinart Powerblend the muscle for blending and chopping tasks, and the 7 pre-programmed speeds give you the speed you need for any job. This medium priced blender gives you indicator lights so that you’ll know what speed you are in at a glance. It comes with a 56 ounce glass jar, a 3 cup processing bowl and 2 blades – one for slicing and shredding and one for chopping. For basic food processing duties, you should be good to go. The lid includes a feed tube and food pusher. It excels as a smoothie maker, but there is a catch. Unlike most blenders where the ice goes in first and everything else gets piled on top, the reverse is required here. Per the Cuisinart Instruction Manual, first the liquids go in, then the fruit and the ice gets piled on top. Failure to do this may result in premature motor failure, so always follow this sequence. Plus, this is the loudest unit on the list, with the noise being compared to a jet plane. But if you are looking for a combination unit, except for the Ninjas, this is the best blender food processor combo on this list. ← What is the Best Water Filter Pitcher in 2018?